Not a revolution but Lara Croft's latest outing is still an excellent adventure. Former employees of Crystal Dynamics have confirmed that various nasty problems arose in the development of Underworld. An unknown 20 year old from Bethnal Green, London has been selected to play the action heroine in the upcoming Tomb Raider: Legend. Eidos has announced that Lara Croft's latest crusade is scheduled for launch in April. 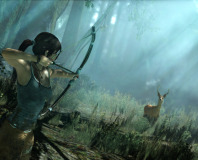 The new website for the latest Lara Croft title goes live, with new information about the technology behind the game. Screens and breakdown inside.